Wednesday, October 17, 2018: Prime Minister Prayut Chan-o-cha is planning a Facebook live after “good” public responses to his newly-announced online presence, the government said. 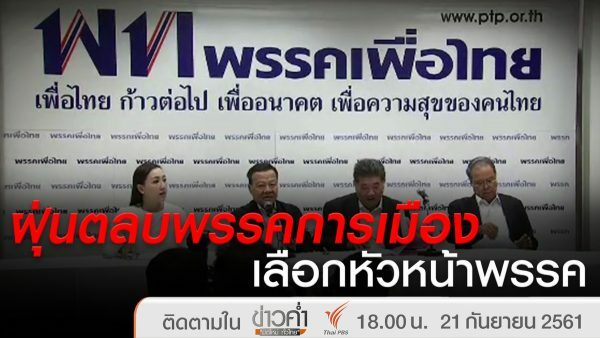 In what could lead to an important development in the near future, public prosecutors have received a police case against Pheu Thai executives in connection with a press conference deemed a dishonest attack on the government’s performance. The prosecutors will announce their decision on whether to pursue the case on November 28. 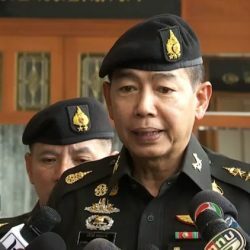 Whereas the alleged offence does not look very serious, as the May press conference by Chaturon Chaisaeng, Chusak Sirinil and Wattana Muangsuk seemed a typical, albeit overblown, criticism of the government’s performance, legal action endorsed by the prosecutors can snowball into a move to dissolve their party. 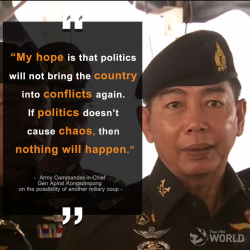 Meanwhile, in the first public statement in his new position, Army Commander-in-Chief Apirat Kongsompong made what appeared to be a textbook speech, saying his troops will “always stay on the people’s side”. 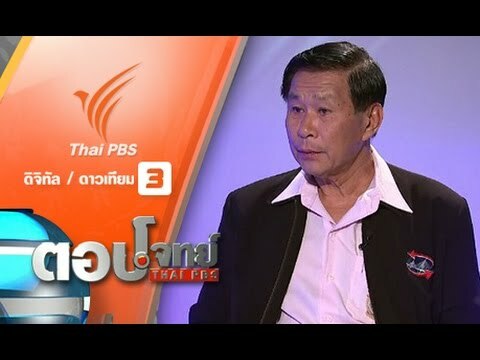 He did not rule out a coup if violent turmoil rocks the country and he was elusive on the Army’s stand regarding the Palang Pracharat Party, considered a political force backing Prayut as the post-election prime minister, saying soldiers don’t know how to play politics but they will “have to be very careful from now on” because the public would scrutinize their every move. Tuesday, October 16, 2018: The first showdown between Prayut Chan-o-cha and Sudarat Keyuraphan as unofficial front-running candidates for the premiership has focused on how to dignify Thailand’s poor population. In her Facebook post, Sudarat said the Prayut government’s “welfare card”, which is informally called “poor people’s card”, highlighted rich-poor division in society. In other words, the unofficial name was an insult to poor people, unlike the health card of the Thaksin government which allowed basically everyone to use, she said. 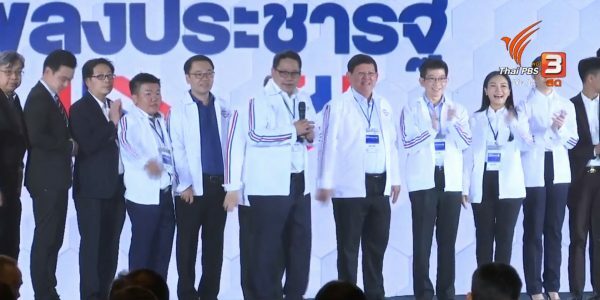 Prayut said today Sudarat, tipped to become the Pheu Thai Party’s prime ministerial candidate, was playing “old-style politics”, in which anything not initiated by her camp was criticised. He said his government’s intention was to help low-income people on spendings that could be subsidized by the state. How the card, which can be used to acquire cheaper-than-usual basic necessities like electricity and public transport, has been informally called is beyond the government’s control, he said. Monday, October 15, 2018: Prime Minister Prayut Chan-o-cha may be playing his cards close to his chest when it comes to whether he will enter mainstream politics, but many analysts said today disclosure about his social media accounts is giving him away. The prime minister’s deputy secretary-general, Puttipong Punnakan, said Prayut is now officially on Twitter, Facebook and Instagram. Political figures use the social media for one reason only, the analysts said. Prayut must be thinking about boosting his rating through the online accounts, they stated. Whether Prayut is learning from Donald Trump is open to debate. The latter has had a large social media following, but that does not necessarily mean he’s getting more popular. The most obvious effect so far has been that the social media have enabled Trump’s contentious statements to travel faster. 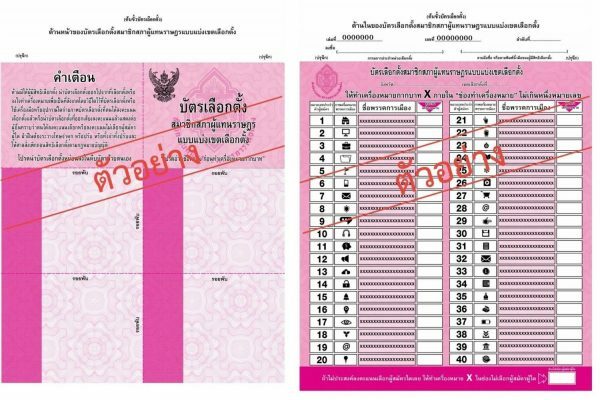 Sunday, October 14, 2018: The Election Commission said today it’s counting on a Bt100,000 reward to stop vote-buying. According to EC Secretary-General Jaroongwit Phumma, evidence of vote-buying leading to a candidate being disqualified from the election will earn whoever presenting the evidence Bt100,000. Speaking at a political forum organised by the Thai Journalists Association, he said, every “witness” will be well protected. He did not say, however, whether the reward will be split or how it will be split if more than one witnesses provided information against the same candidate. He also warned that setting up “nominee parties” could lead to dissolution of the mother party. Whether such a possibility has anything to do with repeated denials over the past few days that some parties are affiliated with others is anyone’s guess. Meanwhile, despite Sudarat Keyuraphan’s name having been on the front pages of most newspapers as the Pheu Thai Party’s front-running candidate for the post-election premiership, her official nomination has not taken place. Candidates will be officially named after an election decree is announced. Or many weeks from now, so to speak.